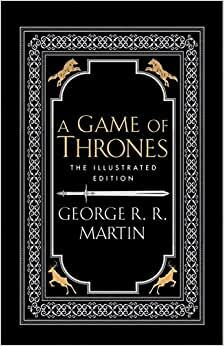 Start reading A Game of Thrones (A Song of Ice and Fire) on your Kindle in under a minute. 3.0 out of 5 starsComparing sizes- leather bound and paper back. 3,640 people found this helpful. I watched the first season of the show and was hooked, but I normally prefer to read the book first, so I ordered this set and have started reading them. 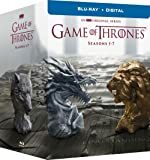 My son advised me I should read the whole series before I watch the other seasons because after the first book & season, the seasons don't always track well with the books. That's fine with me - I'm loving the book more than the show anyway. There are details in the books that film just can't translate, such as the way a character is thinking. I'm amazed at the number of characters and how individual and unique they are. While there is a lot of action and some of it quite violent, there is also humor and tender moments, complicated family dynamics, and good descriptions of the landscape and surroundings so that I can picture what is going on without having to rely on my memory of the show. I'll be ordering more when I get through the first five, as I enjoy reading well written book series. 167 people found this helpful. 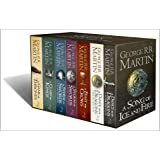 I wanted to read the ASOIAF series before the final season of Game of Thrones airs next year, and and I got this set because I am kind of a sucker for nice editions of books and it was a good price for all five books. I don't want to get into reviewing plots or anything like that because that's already been done elsewhere. If you are considering the leather bound set, you do need to pay attention to the measurements and take a look at the customer images and reviews before you make a decision. These books are small and fat, with barely passable small print that a fair number of readers will need reading glasses to view. They are very much like the leather bound bibles that you can find in many churches and book stores. When you get the set, you need to open it right then. Don't just leave it in the box for a couple of months and then take it out. You'll want to check it for any damage and to make sure all the pages are in tact. I've seen a couple of complaints about damages and missing pages. I checked mine when they arrived and they were in perfect condition. These might be good for travel, or for collectors, but I think that I would recommend trade paperbacks for most people for readabilty. They also make nice gifts, but I think I would ask the person what size and type of book they would prefer first. 79 people found this helpful. 5.0 out of 5 starsThis book is for anyone who loves a gripping story -- no exceptions. What could be said about Game of Thrones, the first of George R.R. Martin's epic series, that hasn't been said a million times? It's absolutely brilliant. Going into these books (I read them after the show began but before I'd seen the show...), I enjoyed my share of sci-fi/fantasy along the lines of Harry Potter, Buffy the Vampire Slayer... fairly light-hearted stuff (in comparison, at least) that always felt grounded in the same world I live in. The one genre I really disliked was "Middle Ages Fantasy" as I called it. Lord of the Rings, for instance, while the films were visually appealing, was not my cup of tea... too detached from reality. So when I first saw articles and clips from the HBO Game of Thrones series, I thought it looked like the one type of fantasy series that I would never enjoy. I held out for a looong time, until 3 different friends of mine with similar tastes in books/shows/films promised me that, while they too disliked this sub-genre of fantasty, this series was different, and I HAD to read the books or start the show. Grudgingly, I picked up the first book, figuring that I'd push myself half-way through it and let me friends know I tried and they were totally wrong. Of course they weren't wrong. What George R.R. Martin has done here defies genre, period. It doesn't matter if you're like me and don't care for this sub-genre of fantasy... it doesn't matter if your like my spouse, and don't like fantasy at all. If you enjoy brilliant, incredibly-developed, thought-provoking stories... those with a strongly developed cast of characters who blissfully lack being "good vs. evil" and instead all display their shades of grey, good traits, evil traits, unique traits, all sorts of traits... then this book is for you. Buy it. Open it up. Start reading. You won't regret it. However, the reviews scared me off. I was afraid the books would be "too small" to read, or "pages would be missing", or even have a "funny smell" to them. All these things I've read in previous reviews. All of which, for my taste at least, has not been a problem. I was under the impression it would be the "size of a pocket bible" and the pages were so thin u could see through them like bible paper. Not the case for me. The set arrived 4 days early and to my surprise they were really heavy, good quality, smaller books. Not nearly as small as my pocket bible. All of my pages are here (from what I can tell) and although I doubt the quality of the "leather" it still feel great in hand and is just stunning to look at. Also the lettering is perfect for reading, sure it's not your normal size but it is still a big enough size that I don't even need my glasses to read it. The colors are gorgeous and it looks great on my book shelf. I've included pictures to show its beauty and also compare the size to an actual pocket bible and its paper. Now let me start reading! 325 people found this helpful.